Children‘s Bible Mission, of which Camp Gilead was the charter member, had its beginning in the early 1930‘s. In the fall of 1932, Mr. & Mrs. Walter Jensen came to Florida with a great burden to reach lost children with the Gospel of Christ. For two years, they worked alone reaching children through school assemblies and as they found opened doors. God was clearly opening these doors in response to a weekly prayer meeting for that purpose. A plan was then presented to some Christian business and professional men: the public school classes would feature a Bible memory program, with a set of awards to be given for verses memorized, the top prize being a free week of camp. Thus, on February 5, 1935, Children‘s Bible Mission was born in St. Petersburg, and in 1948 built their headquarters at 1628 Gary Road, Lakeland, Florida. Soon it was clear that bigger and better camp facilities were needed, and a search was begun. At the same time, people were praying specifically for this need and, in answer to prayer in 1938, the mission purchased the former Polk City Golf Course on Lake Helene for $1.00, where Camp Gilead now stands. Other wonderful provisions included materials and help in constructing the original buildings on the property. Missionaries and volunteers worked hard to put up ten buildings in four months, to accommodate 100 campers! In 1947, Hazel Yeater began working at Camp Gilead, and in 1948 she invited her friend, Edith Hulslander, to come and help with summer camp. When Mr. & Mrs. Ed Jensen moved from the area, Miss Hazel and Miss Edith became the directors and served there for nearly 50 years. Over the course of time, there have naturally been many changes. Old buildings had to be replaced by new ones; more buildings had to be built including the chapel, gym, lodge and lakeside pavilion. These buildings, in turn, had to be renovated over time, with air-conditioning installed, etc. Probably the biggest change was that Bible teachers are no longer permitted to go to public school assemblies with the Gospel as they had once been allowed to do. Throughout the 60‘s and 70‘s Camp Gilead experienced continual change and growth. The problems affecting work in the public schools compelled the diversification and a reaching out to other areas with additional programs of getting the Word of God and His message to young people. Additional weeks of camp were added to reach more teenagers and also to include those not able to earn camp through CBM programs. The camp follow-up program was increased to add to the continuing correspondence programs; a work-camper program for ninth and tenth graders, a junior counselor training program for eleventh and twelfth graders, and a senior counselor training program for the college counselors. 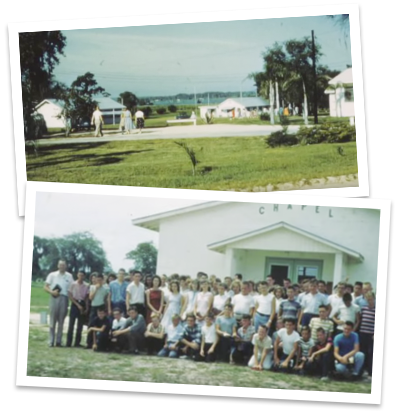 Florida Bible Memory and Mailbox Club programs were carried on in private schools, churches, after school clubs, and through a telephone ministry. Other clubs were held for teenagers as well as a teen rally held at camp each month. Personnel included nine CBM workers, four full-time volunteers at camp, plus many other part time volunteers. In the winter of 1969, a large group of retirees from Berne, Indiana came to help Camp Gilead with various winter projects, and thus began a valuable ministry which continues to this day. This group had grown to include volunteers from Pennsylvania, Michigan, Ohio, Tennessee, Indiana, New York and other states, as well. We are truly blessed to have these willing servants here each winter. They have made possible the accelerated building program. The 60‘s and 70‘s brought not only changes to our programming, but also to our facilities. Some of the projects completed during that time included: an air-conditioned chapel to seat 200, enlarged dining hall to seat 200, gym, craft building, offices, several new cabins, and other buildings. So much has happened at Camp Gilead since 1980. Our lodge by the lake was completed. A new ministry called Creation Critters was developed by Ron Yeater and is growing at a rapid rate. As in all years that the camp has been in existence, God has used the ministries of Camp Gilead to reach into the hearts of kids and change their lives. “Changing lives — one heart at a time” is our motto, and this is what Camp Gilead is all about. Staff & volunteers have come and gone over the years, but each has played a vital role in the lives of all who have been changed here. In 2010, a consultant was contracted to examine the ministry and make recommendations to the Board. As a result, the By-Laws were changed and a new era of governance and administration was adopted. Rev. Kenneth R. Pritt, Jr. was hired as the new Executive Director in 2011. New missionaries were added and Bible Clubs were re-instituted. The picnic pavilion was renovated into the current RCA Pavilion and dedicated in October of 2012. A new sand volleyball court, paintball course and outdoor chapel were also added as part of a capital project that included all new bunk beds and mattresses for every cabin. In 2017, Camp Gilead celebrated 79 years of ministry!